I don't know about you, but a bulk of my spare cash goes on books and magazines. I find so much inspiration from them and always have since I was a child. I purchase a slew of books in particular but not just any and all but only ones that truly resonate with me as I don't want towering bookshelves filled with titles meant to impress my friends - my books are in my home to inspire me and my family. 1. First up, Creative Display by Geraldine James, published by Cico Books. This book is gorgeous throughout with wonderful arrangements of things. I love how Geraldine cleverly shows and tells throughout with pages packed with eye candy that inspires. 3. Another title that caught my eye recently is called Homespun Style by Selina Lake and Joanna Simmons, published by Ryland Peters and Small. This book is very pink, very girly and loaded with white, floral prints and pastel colors. It's total cotton candy sweetness that fans of Shabby Chic, Flea Market style and the handmade movement can really get behind. 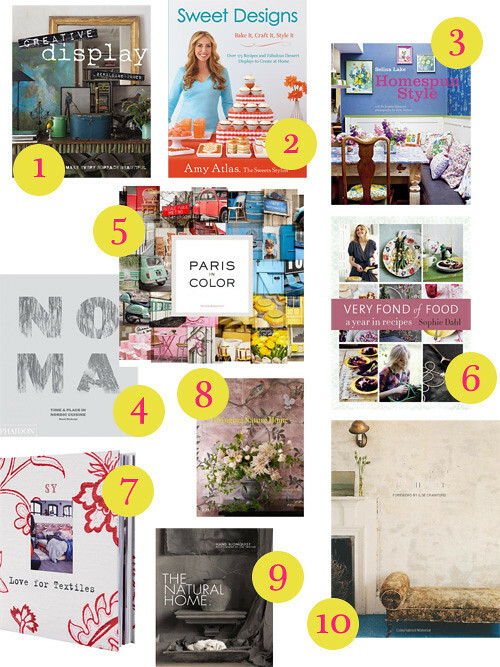 It's filled with the homes of bloggers too, which makes it a very approachable book filled with 'real' interiors. 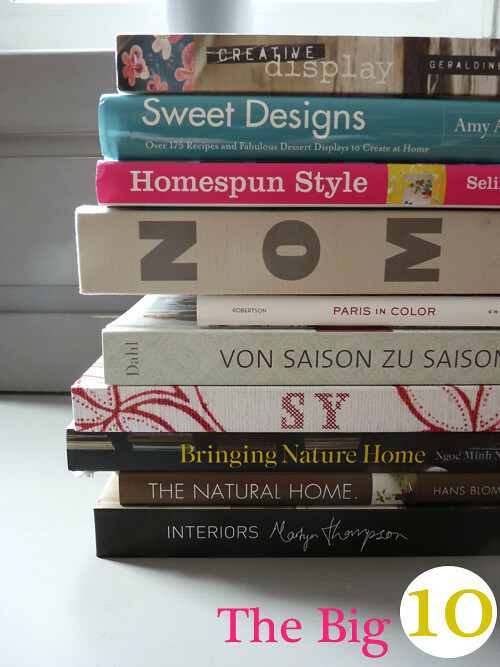 This is the third decorating book by Selina, each one she authors is by theme - the first was Bazaar Style, then Romantic Style and now Homespun Style. Great job, Selina - congratulations! 4. Noma: Time and Place in Nordic Cuisine by René Redzepi isn't a new book but it still feels like it despite that it was published in 2010. It is a breathtaking look at Nordic cooking like nothing you've ever seen before, authored by the very chef who runs a restaurant under the same name in Denmark. Foodies from all over the world visit Noma for the experience of it all - hence the incredibly difficult task of booking a table there. This book isn't a cookbook, it's mostly inspirational and filled with huge images of food and is effortlessly stylish and top notch. 5. Paris in Color by Nichole Robertson is another book authored by a personal friend. Published by Chronicle Books, Nichole is a first time author and her book just rolled out in good book stores everywhere along with shops like Anthropologie where it's the perfect fit. I'm so proud of Nichole and love seeing her photos published so beautifully. Her journey began as simply blog content and an etsy shop and today, she's authoring a book that no doubt will do extremely well and lead her to a million paths I love seeing dear friends find success through their blogs, it's such an inspiration. My copy arrived this morning and I read the introduction immediately and went through the book page-by-page to take in the many beautiful photos. Great work Nichole and also a big thanks to her husband Evan because we all know that writing a book is a family affair! 6. I'm a new Sophie Dahl fan and fell in love with her latest cookbook, Very Fond of Food: A Year in Recipes. She is so likeable and brilliant, I find her take on food refreshing and her books charming and well designed. I think it's so cool that this model-turned-author is the granddaughter of Roald Dahl, a famous short story writer who became one of the most successful and beloved children's writers of all time - have you heard of Charlie and the Chocolate Factory? That's Roald Dahl's work. Anyway, Sophie's book is wonderful and inspirational and makes me want to cook, yum! 7. Ever since finding SY - LOVE FOR TEXTILES in my local IKEA, I've been telling everyone about it. It's a gorgeously tactile book with some of the best styling and layouts ever, it's breathtaking and gave me tons of ideas for drapes in my home - it even inspired me to make the linen curtains in my kitchen last week. This book takes a very visual, creative approach to textiles and making - there are few words and not a single do-it-yourself instruction but somehow I don't feel those things were needed because the photos alone were worth a thousand words - what a wonderful book! 8. Bringing Nature Home by photographer Ngoc Minh Ngo is a heavenly book on floral arranging. My mother will love -- I have to send her a copy because she has a background in floral design so it will really resonate with her and may inspire her to arrange flowers more often. Even if you don't have a natural leaning towards decorating with flowers this book will convert you and make you a believer in sprucing up your space with gorgeous blooms in lush vases, baskets, jars and urns. I love how this book was styled and photographed - it's my current favorite book on floral design and was really needed in the market as so many of them are quite old-fashioned and frumpy. This one is stunning, fresh, a must have! 9. The Natural Home by Hans Blomquist is the latest author from Ryland Peters and Small that seems to have a huge future ahead of him. The images inside are gorgeous and his styling is superb - I like how he intentional messes up things a bit to make them imperfectly perfect. I can't wait to sit down and read it when I get some spare time - I'm interested in learning his take on natural interiors, too. 10. And last, but not least, is Interiors by Martyn Thompson. (Note: It's already available in the UK here, but won't be out in the US until May 1.) This amazing photographer has been commissioned by top publications all over the world for over 20 years and has decided to do his own book sharing his favorite homes. What a great idea for a photographer to author a book like this for interiors - congrats, Martyn on having the courage to take the leap and much success to you! These are just the tip of the iceberg, there are so many more books out there that I love and find inspirational but for now, I've edited my picks down to ten. I hope you've enjoyed this round-up and stay tuned for my surprise author interview next month, a friend of mine just wrote a lovely book and I'll be doing a special interview with her soon, too! Books rock! What are YOU reading? Photo Books: What Are You Leaving Behind?